Large, heavy ships are slow to turn around, and so is environmental degradation once it gets going. But last week, public outcry sent a seismic survey vessel packing and halted the first nascent steps of an oil exploration program off the coast of Belize. Armed with aerial photos and satellite-derived vessel tracks, Belizeans rallied to convince their government to suspend seismic surveying operation just one day after it began. Their protests stand on two premises. One: no environmental impact studies have been conducted. And two: in December 2015, the Government of Belize agreed to ban offshore oil exploration in the Belize Barrier Reef Reserve System, the second largest barrier reef in the world and a UNESCO Heritage site. Despite these facts, on October 12th, Oceana Belize discovered that seismic testing had been approved for offshore and was intended to take place less than one mile from the reef. Used in deep-sea oil exploration, seismic surveys shoot powerful sonic waves into the water to gauge the geological resources held in the rock layers beneath the seafloor. The shock waves are not only powerful enough to penetrate the seabed, but they travel thousands of miles through the water causing damage to whales, dolphins and manatees as well as scaring fish from important habitats and killing their eggs and larvae. 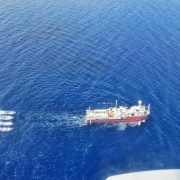 On Monday, October 17th, SeaBird exploration, the company contracted to conduct the survey, announced that their ship, the Northern Explorer, would begin seismic blast surveys in Belize waters. The Belize Coalition to Save Our Natural Heritage called for the Government to stay the decision to allow seismic testing and to open discussions with the Belizean people, more than 190,000 of whom are economically dependent on the reef’s resources. The very next day, Oceana posted video and photos on Facebook showing the Northern Explorer off the coast of Belize with its seismic array already deployed. 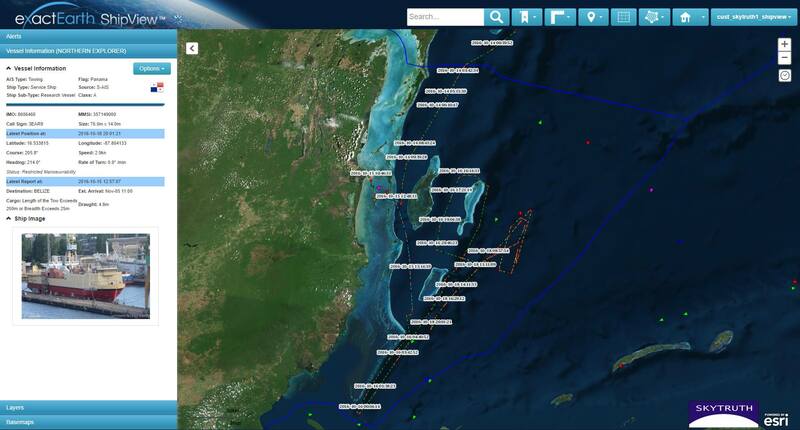 Jackie Savitz, Oceana’s Vice President for the US and Global Fishing Watch, also reached out to SkyTruth for assistance tracking the vessel’s activities. SkyTruth’s analyst Bjorn Bergman verified the Northern Explorer’s track based on signals from the vessel’s Automatic Identification System. He sent Oceana images of the track as it traversed an area of ocean around the barrier reef. Based on multiple concerns raised by concerned citizens regarding the seismic survey currently being conducted in the deep offshore of Belize as well as the fact that extensive consultation with a wider ground of stakeholders did not occur prior the commencement of the survey, the Government of Belize (GOB) has decided that it will suspend seismic operations until such consultations can be conducted. Accordingly, the Geology and Petroleum Department will inform the ship that they are to cease seismic operations immediately. That same day, SeaBird exploration announced that they were returning their vessel to port to prepare to leave Belize. “The fact that the Belizean government stopped the seismic blasting when the public was informed is a classic example of how transparency can actually lead to improved ocean conservation,” says Savitz.